The age of biopic is upon us. From Mr Turner (J.M.W. Turner) and Jimi: All Is by My Side (Jimi Hendrix) to Oscar front-runners The Imitation Game (Alan Turing) and Get On Up (James Brown), the once dreary biographical formula has finally re-energized itself, capturing the hearts of film lovers and critics alike. One film that is sure to win you over is The Theory of Everything, a new film about the life and times of Cambridge physicist Professor Stephen Hawking. Adapted by Anthony McCarten from the memoir Travelling to Infinity: My Life with Stephen by Jane Wilde Hawking (Hawking’s first wife), the film tells the extraordinary story of renowned astrophysicist Stephen Hawking, his relationship with his Jayne, his diagnosis of motor neuron disease and his success in physics. The story starts in 1963 with a young Stephen Hawking (Redmayne) catching the eye of literature student Jayne Wilde (Jones) at a University party. Both are at studying at Cambridge; Wilde is studying medieval poetry of the Iberian peninsula, whilst Hawking is researching into relativity and black holes, the subject that will eventually make him famous. They fall in love and marry and their relationship endures in spite of Hawking’s deteriorating physical condition. After collapsing in the University grounds, Hawking’s is taken to hospital for checks were he is told that he has motor neurone disease and just 2 years to live. We watch the condition take over his life, from the moment he can no longer stand, to the moment he loses his ability to speak. Yet as Hawking’s health deteriorates, his career takes off. What makes The Theory of Everything special is that transcends the pitfalls of typical biopic. Whilst it is biographical in nature, it is ultimately a love story. The film is shot in a fluid, fast moving style and Director James Marsh does a fantastic job of keeping the tempo up, from the couple’s free kiss at the summer dance to Hawking working out complex equations on the blackboard. The film’s cinematography is equally excellent with Benoit Delhomme using natural light and a handheld camera to create a fresh and invigorating look. Eddie Redmayne is outstanding as Stephen Hawking. His portrayal of Hawking’s witty humour and restless intellectual curiosity is brilliant. The British actor also does a fantastic job at capturing Hawking’s physical afflictions, from his Chaplinesque walk, to the way his neck tilts when he is in his wheelchair. The result is a genuine, poignant and incredibly moving performance that is Oscar-worthy. Felicity Jones is equally impressive as Hawking’s devoted wife Jayne. Whilst the film is ultimately a biography of Stephen’s life, the film is as much about Jayne’s journey as it is Hawking’s. Jones does an excellent job of portraying a God-fearing woman trying her best when faced with the love-vs-responsibility dilemma. The film has been well-received in the press. Justin Chang of Variety called it “A stirring and bittersweet love story, inflected with tasteful good humor” while Catherine Shoard of The Guardian praised Redmayne’s performance calling it “an astonishing, genuinely visceral performance which bears comparison with Daniel Day-Lewis in My Left Foot.” The film’s producers, writer, director Marsh, and actors Redmayne and Jones are widely favored for award success this season. Understated, intelligent and incredibly moving, The Theory of Everything is moving tearjearker about one of the world’s greatest living minds. A touching tribute to a brilliant man and his brilliant family. 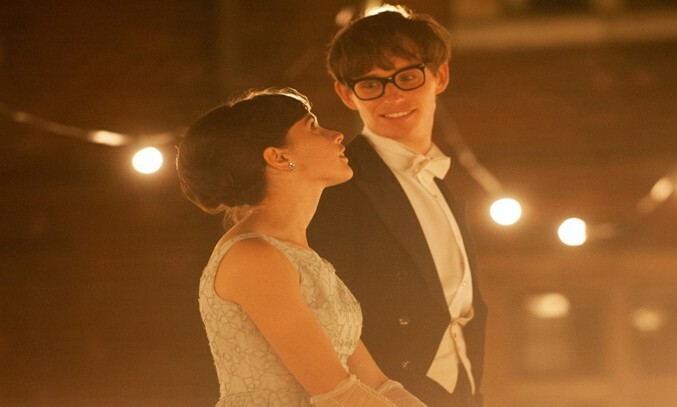 The Theory of Everything is on general release in the UK on 1 January 2015.